ORLANDO, Fla. (AP) — College students around Florida rallied Monday to demand the arrest of a neighborhood watch captain who shot an unarmed black teen last month, though authorities may be hamstrung by a state law that allows people to defend themselves with deadly force. Police have described the man who fired the shot, 28-year-old George Zimmerman, as white; his family says he is Hispanic and is not racist. Zimmerman claims he shot 17-year-old Trayvon Martin last month in self-defense during a confrontation in a gated community in Sanford. Students held rallies on the campus of Florida A&M University in Tallahassee and outside the Seminole County Criminal Justice Center, where prosecutors are reviewing the case to determine if charges should be filed. The students demanded Zimmerman's arrest. Zimmerman spotted Martin as he was patrolling his neighborhood on a rainy evening last month and called 911 to report a suspicious person. Against the advice of the 911 dispatcher, Zimmerman then followed Martin, who was walking home from a convenience store with a bag of Skittles in his pocket. "I don't think a man who exited his vehicle after the 911 dispatcher told him to stay inside the car can claim self-defense," Carl McPhail, a 28-year-old Barry University law school student, said at the Sanford rally. The 70 protesters at the Sanford rally chanted "What if it was your son?" and held posters saying, "This is not a race issue." Many carried Skittles. 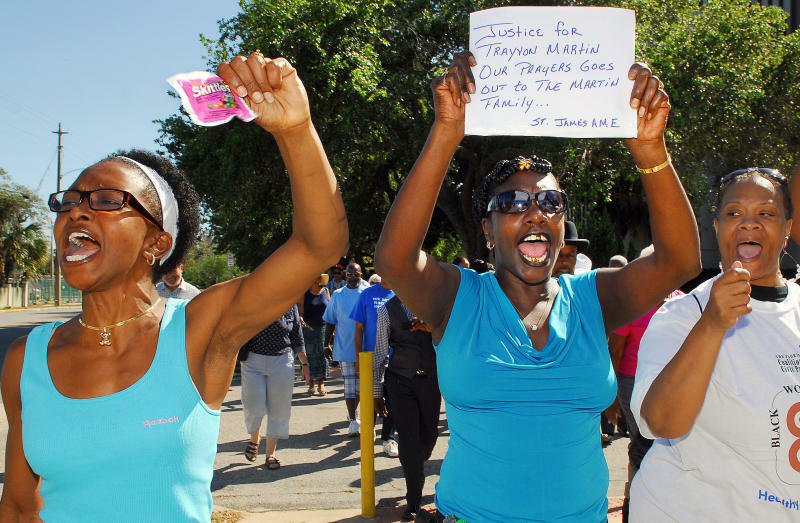 Martin's parents and other advocates have said the shooter would have been arrested had he been black. "You would think that Sanford is still in the 1800s claiming that this man can call self-defense for shooting an unarmed boy," restaurant owner Linda Tillman said. 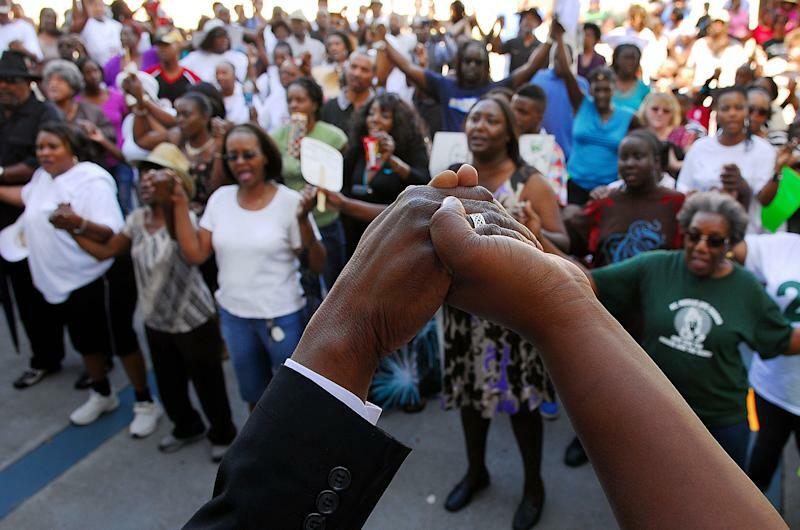 The case has garnered national attention and civil rights activist Al Sharpton and radio host Michael Baisden planned to lead another rally Thursday in Sanford. U.S. Rep. Corrine Brown, D-Fla., along with members of the Congressional Black Caucus and the Congressional Hispanic Caucus, have asked that the U.S. Department of Justice to review the case, and White House spokesman Jay Carney said Monday during a briefing that officials there were aware of what happened. 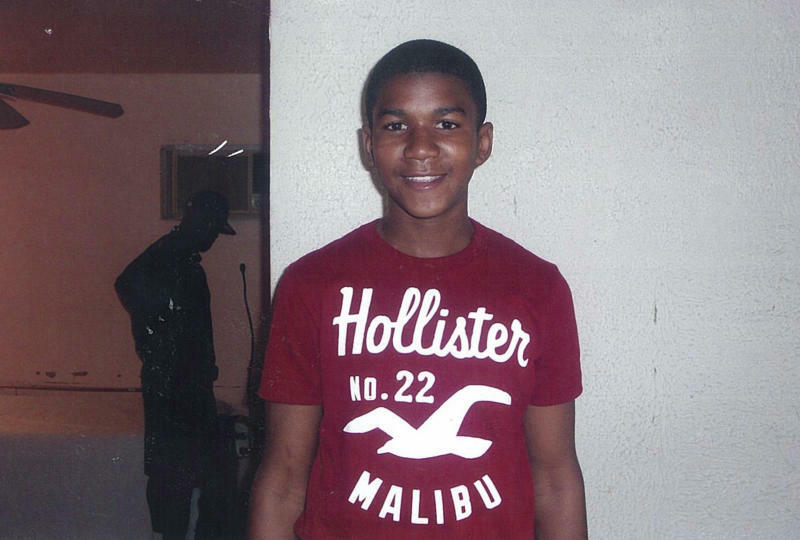 "Our thoughts and prayers go out to Trayvon Martin's family," Carney said. "But obviously we're not going to wade into a local law enforcement matter." Late Monday, Florida Gov. Rick Scott directed the state Department of Law Enforcement to help local authorities in their investigation. The governor said in a memo to department Commissioner Gerald Bradley that the circumstances surrounding the death "have caused significant concern within the Sanford community and the state." Prosecutors may not be able to charge Zimmerman because of changes to state law in 2005. Under the old law, people could use deadly force in self-defense only if they had tried to run away or otherwise avoid the danger. Under the new law, there is no duty to retreat and it gives a Floridian the right "to stand his or her ground and meet force with force, including deadly force," if he feels threatened. Prosecutors can have a hard time making a case if there is no one else around to contradict a person who claims self-defense, said David Hill, a criminal defense attorney in Orlando. So far, Sanford police have said there is no evidence to contradict Zimmerman's claims. "If there is nobody around and you pull a gun, you just say, 'Hey, I reasonably believed I was under imminent attack. Hey, sorry. Too bad. But you can't prosecute me,'" Hill said, somewhat tongue-in-cheek. Gun control advocates said the case is emblematic of permissive gun laws in Florida, which was among the first states to allow residents to carry concealed weapons. Florida was the first state to pass a "Stand Your Ground" law, which has been dubbed a "Shoot First" law by gun control advocates. Currently, about half of all U.S. states have similar laws, said Brian Malte, legislative director of the Brady Campaign, which describes itself as the nation's largest organization dedicated to the prevention of gun violence. "It's coming to dangerous fruition," Malte said. "There are more states like Florida." The "Stand Your Ground" law's legislative sponsor, Florida Rep. Dennis Baxley, said it wasn't written to give people the power to pursue and confront others. "That's not what this legislation does," said Baxley, a Republican. "Unfortunately, every time there is an unfortunate incident involving a firearm, they think it's about this law, and it's not."